The days of traditional news gathering and reporting seem to be a thing of the past. Look no further than our nation’s capital, where social media tweets have replaced big news sources for official positions, particularly out of the White House. 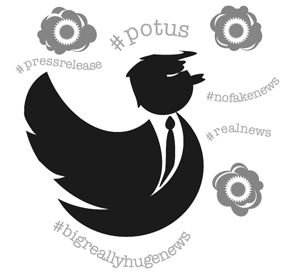 Washington being Washington, the press has been left to take shots at the president’s tweets, trying to find a scandal between the hashtags. How does this impact your business? If you are in charge of corporate marketing and communications, it has a big impact. The traditional press release to media sources that may or may not get picked up is quickly being replaced by posts on social media. The advantages of taking a social media approach to communications is twofold: you can put out the info you desire without the extra filter of the media picking it apart and you can send it out whenever you would like. You are not on the timetable of an outside source. In this instant information age, social media makes a lot of sense. Is there a case when social media does not make sense? If there is trouble brewing in your company, there is a big reason to steer clear. Let’s face it, stuff happens in every business. Not every employee is happy. Not every customer gets everything they want. Social media gives everyone – especially the disgruntled – both a voice and an audience. I had a customer who was in contract negotiations with some of their labor. Someone in the labor force was not happy with the direction of those talks and took to the corporate Facebook page to express his displeasure. What had been behind-the-doors conversations were now posted for the world to see. It’s one thing when someone lashes out at your company on their personal account, but this was posted on the company’s Facebook page. Ouch! How do you control business social media communications so that you don’t paint yourself into a corner that is negative, hateful and nasty? First, realize that you cannot control what other people say, nor should you try. The First Amendment grants freedom of speech and does not qualify that right by requiring you to say something worthwhile and uplifting. But you can control what you post on the company side of things. Social media is not the place for your business to post controversial subjects. Keep your posts informative, but mellow. That’s not to say you cannot post anything that would cause your audience to get excited. By all means, post exciting content. But always ask yourself if what you are posting can be seen in a negative light. If so, rethink the medium you are using to communicate it. You can also limit comments on some social mediums. For instance, YouTube allows you to choose if you want the comments function to be turned on or off. If there is a chance that someone might take issue with what you are posting, be careful to use a medium that allows you these kind of controls. Should you respond to the negative comments left for you? It depends. Ask around and find out if anyone knows who the person is first. Are they a customer? Then yes, respond to them in a positive manner. But you may want to actually contact them by phone or in person before posting a response on social media. Your post needs to be written so it is clear you have had a conversation with them and have either resolved their problem or are working on it. If the person is not a customer, think twice before responding. I had a client who received a negative response on their Google My Business page. I did a little investigating and found that the man who posted the negative response had not been a customer, nor was he likely to be a customer. He was a truck driver that had left a slew of negative comments on Google sites, particularly those of restaurants where he had eaten. My customer was not a restaurant and was not in the trucking business. We did not respond to him on social media and asked that he be listed as a spammer. It is never a good idea to get into a shouting match with anyone over social media. As much as you might be in the right and are just trying to guard your company’s good name, it just sounds petty. Plus, you are inviting more comments from the many social media hate scavengers that do nothing but try to blow up corporate sites all day long. Take a lesson from the Trump Administration on that one! There are haters who are looking to tear you down. Be wise about what you post.